Add it to your slow cooker then walk away until dinner time. 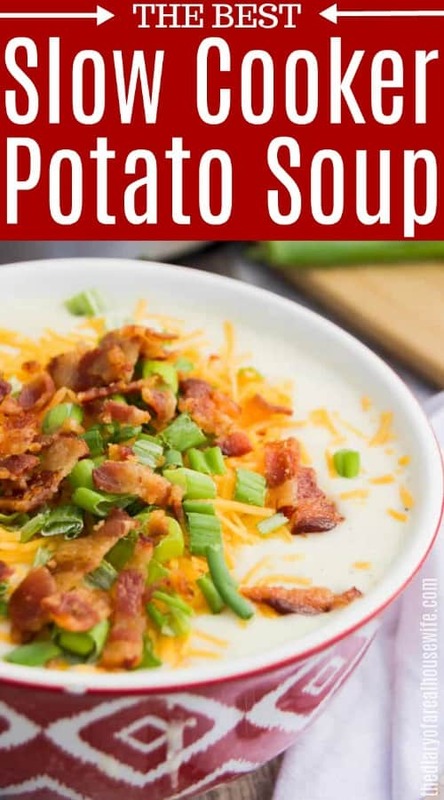 This Crock-Pot Potato Soup is the perfect potato soup, I topped mine with bacon, shredded cheddar cheese, and green onions. This soup is so simple to make and it’s ALL made in the slow cooker. Start by peeling and washing your potatoes. I diced mine then add them to my slow cooker. Add onions, broth, salt, and pepper to your slow cooker with the potatoes. Then cook on low for 6-7 hours or in high for 3-4 hours until potatoes are tender. Add sour cream and heavy cream to the soup. Mix and mash or use an immersion blender to blend soup until smooth. 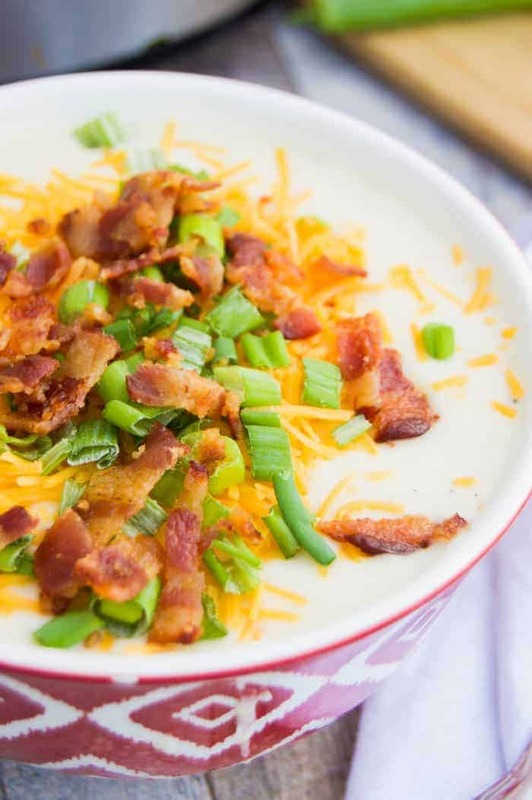 Serve warm topped with cooked and crumbled bacon, shredded cheese, and green onions. This soup can easily be made on the stove top if you don’t have slow cooking time. Start with the potatoes, broth, onions, salt, and pepper. Since you will have more water reduced on the stove top when cooking it faster add 1 extra cup of broth. Once tender remove from heat add sour cream and whipping cream and mash and blend until smooth. Serve topped with the same bacon, shredded cheese, and diced green onions. Roasted Red Potatoes: Tossed in coated in a zesty Italian seasoning then baked. These Roasted Red Potatoes are the perfect side dish recipe to any meal. Baked Cheesy Ranch Potatoes: These Baked Cheesy Ranch Potatoes make the best side dish for any meal. Tender potatoes mix with ranch dressing, cheddar cheese, and seasoning. Bake until cheese is melted and then serve. Option for topping: Bacon, shredded cheese, and green onions. Add potatoes, onions, broth, salt, and pepper to your slow cooker. Cook on low for 6-7 hours or in high for 3-4 hours until potatoes are tender. Add sour cream and heavy cream to the soup. Mix and mash. Use an immersion blender to blend soup until smooth. 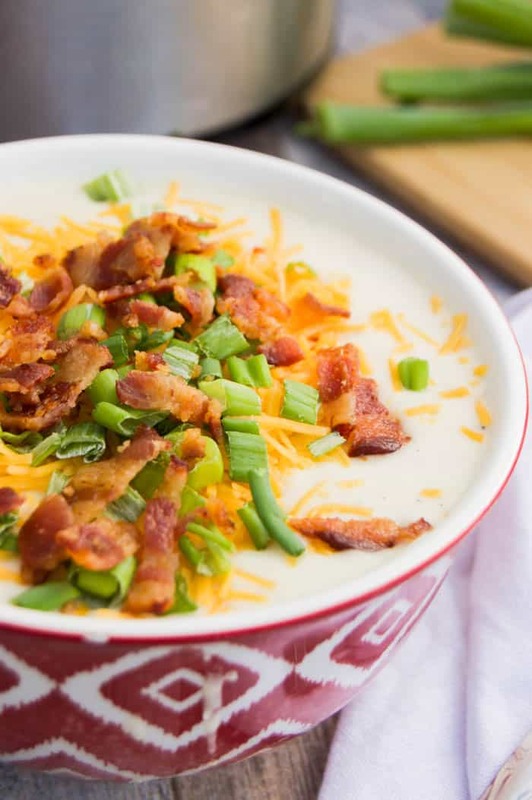 Serve warm topped with cooked bacon, shredded cheese, and green onions. Yummy yummy! 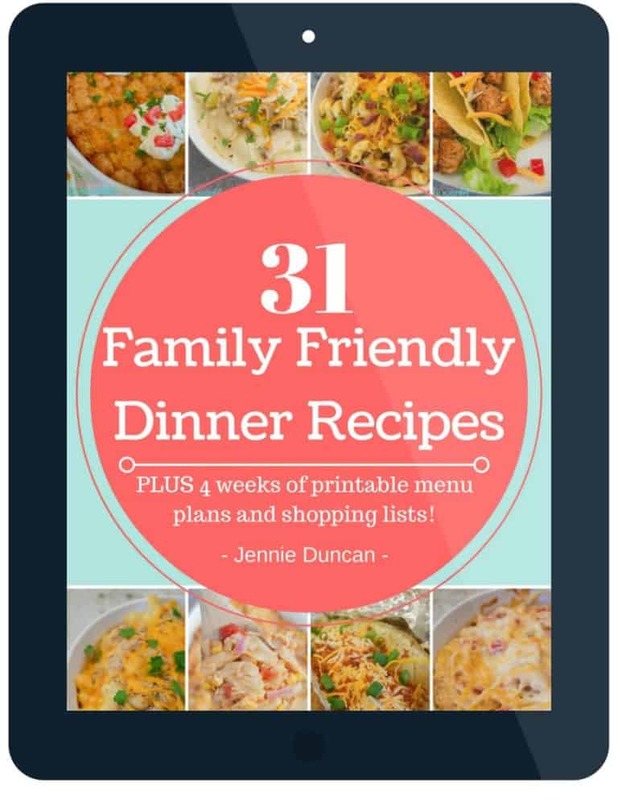 I use a crockpot recipe similar to this one, and it always turns out delicious! Great cold weather food! This looks so good! I am definitely going to be trying this one. Wow, this looks incredible!! The bowl makes it look like it came from a restaurant! Yum, looks delicious! And I’m super jealous your husband works at Panera, their broccoli cheddar soup is my absolute favorite! Oooh, I’m totally jealous of your access to yummy Panera food! My closest one is 30 min. from home. *sad face* Their bread bowls make me drool.. 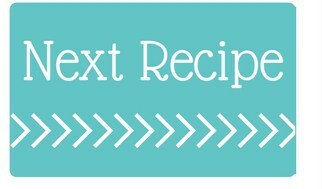 I will have to get some and try out your recipe, it looks delish! That is my kinda dinner! I’m a sucker for a bread bowl! 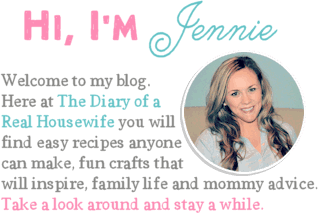 Thank you so much Jennie..! I am linking back and following you.